Dr. Antoine Jaklis is an associate professor of head and neck surgery and facial plastic surgery. French, Lebanese – Head and Surgery specialist. President of the Lebanese Society of Otolaryngology- Head and Neck Surgery. AUB and USJ graduate in Beirut. He specialized in head and neck tumor surgery and maxillofacial and facial plastic surgery in Montpellier and Nice University Hospitals in France. 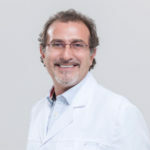 He is currently a full-time attending surgeon and associate professor at Saint Georges Hospital University Medical Center and teaches head and neck anatomy and nasal pathology at the university of Balamand school of medicine since 2000. Since 1998, Dr Jaklis has performed more than 6000 facial plastic surgeries including 4000 nose surgeries and over 20000 procedures including eyelids, facelifts and ear surgeries. The following are some of Dr Jaklis procedures. Facelift surgery: Corrects sagging skin along the neck and jowl region, providing a tighter, yet natural-looking appearance. For optimal results, facelift patients often undergo neck lift surgery, as well in order to attain a more defined facial appearance. Nose Surgery: Alters the structure of the nose in order to correct cosmetic imperfections and/or to improve breathing obstructions. Dr. Jaklis also performs revision rhinoplasty for corrections of dissatisfactory results from a previous nose surgery. Eyelid surgery: Restores a firmer, younger eye area with the removal of excess fat tissue and skin from the eyelids. This procedure may be performed on the upper or lower eyelids. For optimal results, patients may undergo both upper and lower eyelid surgery. Dr Antoine Jaklis stands today as an opinion leader in the field of facial plastic surgery in Lebanon and an international opinion leader and speaker in the area of nasal and facial aesthetic surgery.